“A baby is born with a need to be loved and never outgrows it.” – Frank Clark. Babies are the wonderful creation or rather a gift from the God which strengthens the love and bonding between people around them. They are always the #FirstLove for their parents. They are the bundle of happiness who with their one smile can bring the world on their feet. Such is their innocence. In everything they do, they smile and always be happy. That is the biggest reason why we simply adore babies. Their first crawl, first try at uttering something, stretching of their arms after a good sleep and many of their moves always brings a smile and happiness on parents’ faces. So when it comes to babies, it is but natural that we tend to give the best to them. 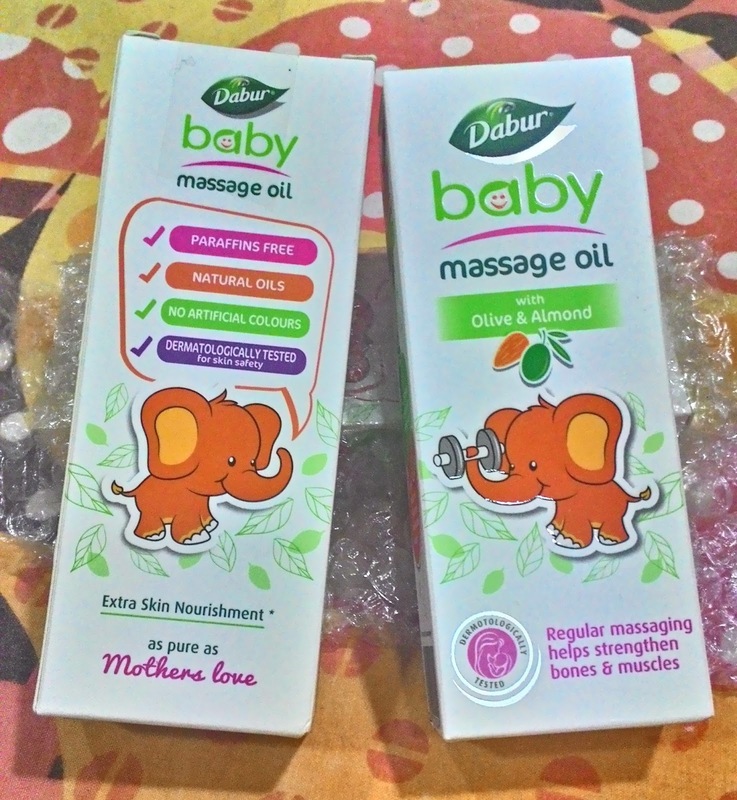 This is exactly what I did as a parent to my bundle of joy, started using one of the best product to massage and nourish the soft and smooth skin. Initially there were rashes seen on the body, few months after the birth. We still persisted with the traditional method of massaging with the oil that was being used since generations. But somewhere I was left dejected and started consulting doctors. That time one of my friend suggested using Dabur Baby Oil with Olive and Almond. Luckily, at the same time I got this opportunity from BlogAdda to check the oil on my baby and see for myself whether it proves to be good or not. I applied for the product and to my surprise it arrived in style, just like my little one!! The packaging and the labelling as you can see in the above pic by Dabur is quite amazing. As soon as I received the bottles, I was excited to apply the oil on my little one and the very next morning I tried it. The oil is a wonder for me as it is the first baby oil that I have come across which smells great. With a mix of premium natural oils like almond, olive and jajoba it definitely spreads the fragrance all around. The oil is smooth when placed on the palm and spreads easily when applied on my baby. He thoroughly enjoyed the massage while I enjoyed massaging him with the all new Dabur Baby Massage Oil. Also, using it continuously for 5 days gave me a sense that my baby’s skin seems to much more softer than before and there are no signs of any rashes on his body. I am now happily relived that my baby doesn’t seem all reddish after massaging and moreover the product pack keeps him engaged while I massage him. 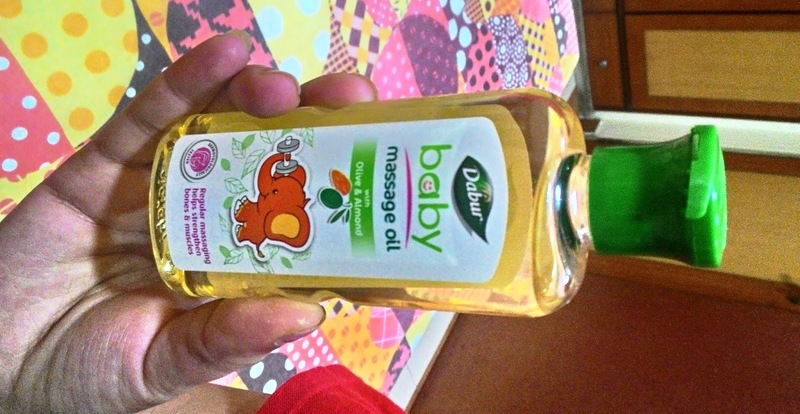 All in all I am in love with the Dabur Baby Massage Oil and my #FirstLove and I highly recommend using the product. 1) It is made up of Natural oils like Almond ,Olive, Jojoba, Sun flower and Sesame oils. 2)It provides nourishment to the Baby’s skin. 3) Olive is known to help provide nourishment to the babies skin. 4) Almond is known to gently moisturizes your baby’s delicate skin making it soft and supple. 5) It is Paraffins Free and suitable for the Baby’s skin also. 6) It does not contain any artificial colours. 7)It is safe to use on skin as it has been dermatologically tested. 8)Regular massaging helps strengthen bones and muscles. 9)An attractive and playful product pack which helps engage the baby while massaging. The oil is not at all heavy on the pocket as well. A 100ml bottle just costs Rs.110/- only. So don’t wait for any other baby oil for massaging and start using Dabur Baby Massage Oil for a more nourished baby skin and a healthy baby. Drumrolls please!!!! 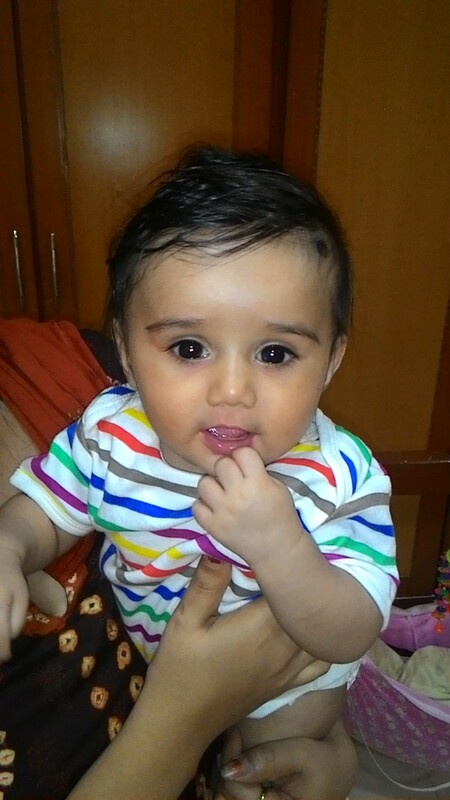 Here is the pic of my baby on whom I tried The Dabur Baby Massage Oil.